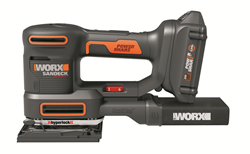 The new WORX 20V Sandeck 5-in-1 Multi-Sander does the jobs of a 5 in. random orbit sander, ¼ sheet finishing sander and detail sander. Plus, its detail sanding pad is equipped with finger and contour attachments for fitting into tight spaces and around curves. What sets this versatile, cordless multi-sander apart is its exclusive power transmission design with Mode Max Technology that maximizes the performance of each sanding function. 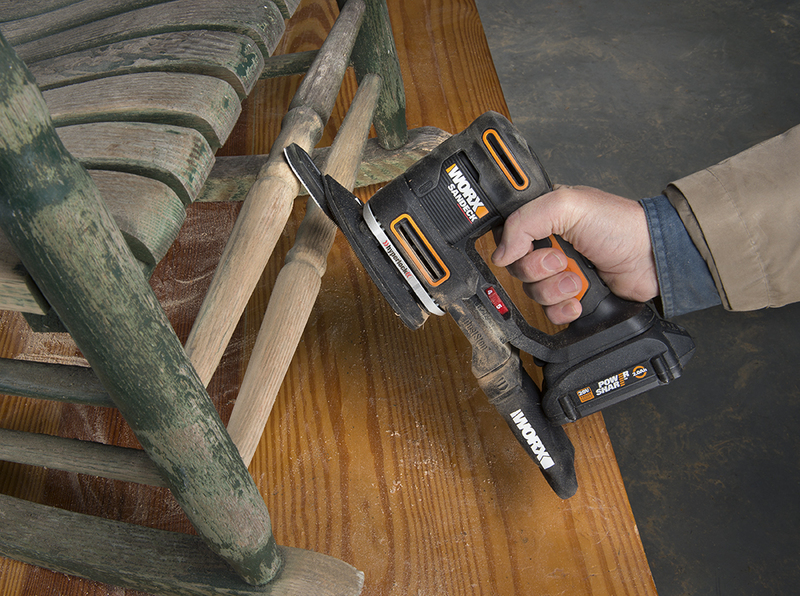 The new WORX® 20V Sandeck™ 5-in-1 Multi-Sander does the jobs of a 5 in. random orbit sander, ¼ sheet finishing sander and detail sander. Plus, its detail sanding pad is equipped with finger and contour attachments for fitting into tight spaces and around curves. When Sandeck’s 5 in., random orbit sanding pad is attached, it makes small ellipses where no two orbits are the same during rotation. This leaves a smooth, swirl-free finish. The multi-sander’s orbital diameter is 3/32 in. A ¼ sheet finishing pad usually is preferred for working on larger work pieces. In this mode, the sanding speed ranges from 4,000 to 10,000 orbits per minute (no-load). Depending on grit selection, the sanding action varies from fast, aggressive material removal to laying down a fine, smooth finish prior to staining or painting. The ¼ sheet sander’s overall pad dimensions are 4-1/2 in. x 5-1/2 in. Sandeck’s detail sanding pad with finger and contour attachments is great for sanding in hard-to-reach areas, such as corners in drawers and cabinets, between spindles on stairways, along curves and in other confined spaces. The detail sander’s overall pad dimensions are 5-1/2 in. x 3-1/2 in. Changing sanding pads is quick and easy. Sandeck’s innovative clamping system employs Hyperlock®, which exerts one ton of clamping pressure to prevent sanding pad slippage. Sanding speeds are controlled with the multi-sander’s five, variable speed settings dial. Sawdust is funneled into the DustStop™, a micro-filter box, which is removable and emptied for a clean working environment. The Sandeck Multi-Sander weighs 4.4 lbs. (with battery). It is powered by a 20V MAX Lithium, 2.0 Ah battery with a built-in power gauge indicator to show the charge level. 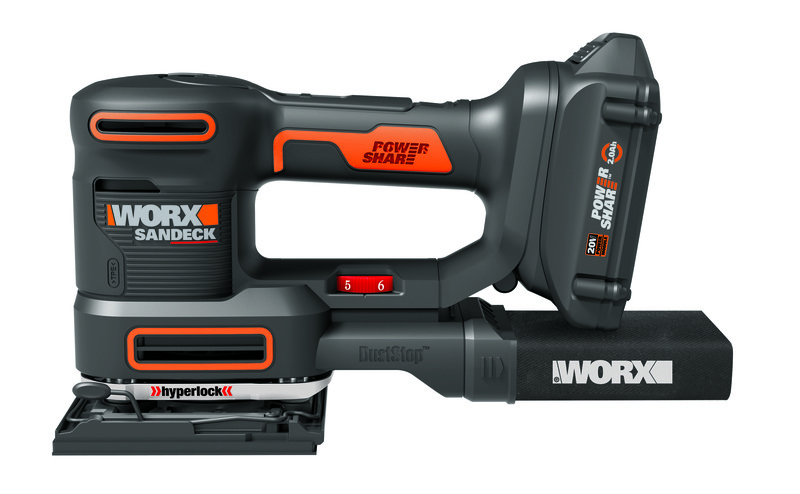 The 20V battery pack is part of the WORX Power Share program and is compatible with other WORX DIY and lawn & garden tools. The Sandeck Multi-Sander comes with a 20V MAX Lithium, 2.0 Ah battery; 20V, 5 hr. charger; removable dust port; and 5 in random orbit, ¼ sheet finishing and detail sander attachments. Detail finger and contour attachments also are provided, as well as 15 assorted sanding sheets and a storage bag. The WORX 20V Sandeck 5-in-1 Multi-Sander (WX820L, $119.99) is available at worx.com and online retailers, including Amazon. It is covered by the WORX three-year warranty. WORX 20V Sandeck 5-in-1 Multi-Sander (WX820L) WORX 20V Sandeck 5-in-1 Multi-Sander includes detail sanding pad with finger and contour attachments for sanding in hard-to-reach areas. 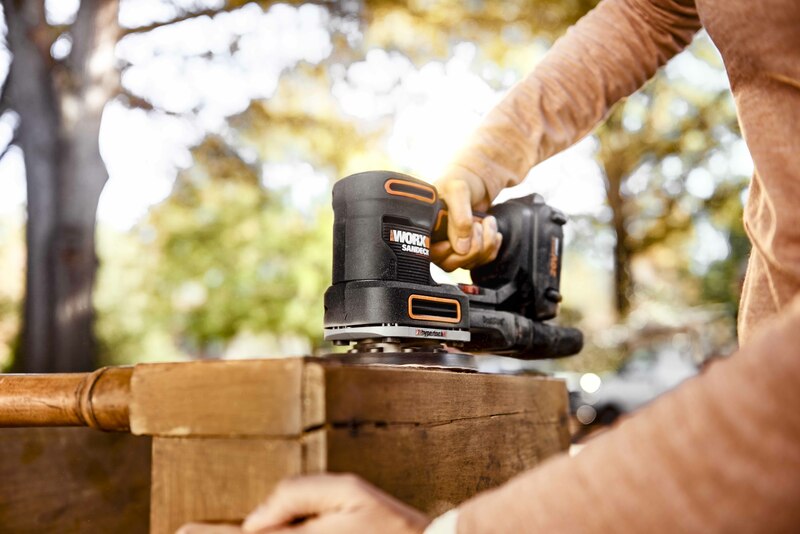 WORX 20V Sandeck 5-in-1 Multi-Sander's 5 in., random orbit sanding pad leaves a smooth, swirl-free finish.